The relationship between St. Louis Rams rookie cornerback Janoris Jenkins and the team is off to a rocky start because of a verbal pre-draft agreement that's impermissible according to terms of the collective bargaining agreement. Jenkins, who played his final college season at North Alabama after being dismissed by Florida, and the Rams have yet to agree on a contract. Aside from typical issues regarding the payment of signing bonus money (the Rams want a significant deferral over the four years of the deal), there is a dispute over who will financially advise Jenkins. Rams coach Jeff Fisher, according to four sources familiar with the situation, wants Lou Taylor of Tri Star Sports & Entertainment Group to advise Jenkins. The second-round pick, projected by some evaluators as a top 10 talent, has signed at least one set of documents with Taylor's company, a copy of which has been obtained by Yahoo! Sports, although Taylor strongly denied last week that she is working with Jenkins. "I do not work for Janoris Jenkins," said Taylor, who twice hung up on conversations with Yahoo! Sports and sent a text message threatening to inform the NFL Players Association that she was questioned about Jenkins. During April's NFL draft, Fisher made Jenkins' agent, Malik Shareef, promise that Jenkins would hire a business manager to help Jenkins navigate his personal issues, which include fathering four children with three women. There is a fourth woman who is claiming she has another child with Jenkins. However, according to last year's CBA, the pre-draft understanding between the Rams and Jenkins' camp is not allowed and is "unheard of," according to an NFLPA source. The league and NFLPA have since contacted the Rams over the matter. A Rams source said last week: "We know there can't be any pre-conditions to the contract." Yet, according to the sources, Fisher remains insistent that his recommended advisor manages Jenkins' finances. However, both sides hope to reach a resolution that doesn't involve some form of legal action by the NFLPA. Leading up to the draft, Jenkins already had a team of people working with him, including Shareef, Army staff sergeant Sandy Cornelio and financial advisor Rich DeLuca of Merrill Lynch. Jenkins has taken out a bank loan and said in March that he used much of the money to bring his child-support payments up to date. Jenkins, who has not returned messages regarding Taylor and the Rams, seemed content with his management team prior to the draft. Subsequently, he has grown increasingly unhappy with being forced to use Taylor, who two sources said is planning to charge him $120,000 over four years for her services. The duties would include managing the child-support payments and placing him on a budget. Taylor has worked with many high-profile clients, including Fisher and Britney Spears. She was also fired by Lindsay Lohan in October. The relationship between Taylor and Fisher seems touchy to Jenkins because he wonders if Taylor would relay personal information to the coach. 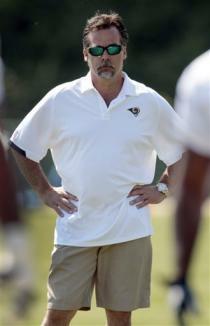 Two sources said Jenkins signed documents with Taylor merely as a way of placating the Rams. Jenkins also asked an NFL representative at the league's rookie symposium about whether the team could force him to choose an advisor. Cornelio said on several occasions that he is not seeking payment from Jenkins, who he has known since Jenkins was at Pahokee (Fla.) High School.DeLuca works on a percentage basis but multiple rates fees could be included in accordance with Merrill Lynch rules. The Rams, according to three of the sources, have raised concerns about how many people are involved in Jenkins' finances and privately question the effectiveness of Cornelio and DeLuca, particularly in light of Jenkins' history at Florida. Aside from the numerous children, Jenkins was kicked out of the school after being arrested for marijuana possession twice in a three-month period. Although Jenkins' issues contributed to him falling to No. 39 overall, he hasn't had any more drug issues or children since working more closely with Cornelio. Among other things, Cornelio said in March that he regularly drug tests Jenkins. Though the two sides have not revealed a ballpark range for negotiations, the No. 39 pick in last year's draft, Akeem Ayres, signed a four-year, $4.9 million contract with the Titans that included a $2 million signing bonus.